Leaving Bute on the last boat from Colintraive, I spent some time at my wife Jane’s parents’ house in Colintraive, weighing and repacking my rucksack and day sack in order to comply with the airline weight restrictions, as this can be difficult given the amount of gear required for high mountains. Finally packed, and after a nap, I drove to the airport, arriving at 3am to find most of our group already assembled at check in. Most of us had never met each other before, so there was a flurry of introductions to the others and to the expedition leader, Rolfe Oostra, a tall, friendly Australian hailing from Canberra and an experienced and internationally recognised mountaineer. The Kilts to KJ group proved to be a very diverse and interesting group of people, with some experienced in mountaineering and some not. Work backgrounds included finance, medicine, engineering, accountancy, textiles, law, music, farming and fish farming, software and business development – but all of us were committed to raising funds for Aberlour’s work to help homeless and runaway children. After group photos wearing our kilts, and a ‘thank you’ send off from Aberlour’s fundraising executive, Jane Wyman, we checked in our bags and our KLM flight departed on time bound for Amsterdam. Following a quick transfer at Schipol, we boarded the long haul 12 hour KLM flight for Tanzania – and after a splendid journey crossing the green of Europe, the silver blue of the Mediterranean and the burnt ochre of the Sahara, we glimpsed Lake Victoria as dark fell amongst the towering Equatorial cumulonimbus clouds. Intense heat -We arrived in Kilimanjaro International Airport at 9pm local time and disembarked to allow the flight to carry on to its final destination, Dar es Salaam – ‘city of peace’ and the main commercial centre, though no longer the capital, of the United Republic of Tanzania. After queuing in the intense heat and producing our yellow fever certificates, and paying the local fee of 50 dollars, we collected our visas and made our way through the bustle of returning locals, aid workers and charity workers to collect our rucksacks. There we were met by our local fixer Samson, who was responsible for all our logistics and arrangements off the mountain itself. Stepping outside into the tropical night, we made our way to our bus, where our rucksacks were quickly loaded on to the roof by Samson’s men and covered with a tarpaulin, before setting off, packed together like sardines but in good spirits, for our base hotel near Marangu. Arriving at the Hotel Capricorn, we were greeted warmly by the staff, were fed and paired up with our roommates, and shown to our rooms. I was paired with Paul, a cheery solicitor from Glasgow. Next morning, in the tropical heat, we were comprehensively briefed on our route by Rolfe, who emphasised that what we were about to attempt was difficult and strenuous – but most of us would make it if we followed his advice. Rolfe explained that climbing Kilimanjaro – known by pretty much everyone as KJ – was very tough, and that the last day is particularly tough and steep. If KJ was in the Andes, or the Himalayas, you would spend three weeks in acclimatisation before attempting the summit. KJ accounts for seven out of every ten cases of Acute Mountain Sickness (AMS) across the world: this is why the average success rate is less than 50 per cent. Rolfe emphasised the dangers of AMS and what we should do to avoid succumbing to it: that we should walk slowly (‘Pole Pole’ in Swahili), and keep well hydrated by drinking enough water to produce clear and copious urine at all times. Rolfe spelled out the markers and symptoms of AMS, such as headache, nausea, disorientation, sleepiness, and warned that if you were suffering from three or more of these symptoms, then you would have to descend. Very difficult -Rolfe also warned that when we set off, the lead porters’ pace would be so slow we would consider it a joke – but that by summit day, at the same pace, we would be begging him to slow down. We would gain about a thousand metres on the first day, to 3,200m at first cave, then it was only three hundred metres to Kikelewa caves the next day and another seven hundred the next to Mawenze Tarn, where there would be an opportunity to climb to about 4,700m on Mawenzi, which is KJ’s sister peak – for those feeling good enough. On day four we would traverse the saddle between Mawenze to KJ, dropping down to 4,100m and climbing back to 4,750m – and then day five would be ‘summit day’, climbing to the peak of 5,896 metres. Cold is also a danger on the mountain – Rolfe had been guiding a group the week before in conditions that were very difficult, with an air temperature of minus 25C and a strong gale blowing on the crater rim, a combination of conditions which had seen only three members of a party of 15 make it to the summit. Keeping your drinking water from freezing is critical above 4,700m, to keep you hydrated, and Rolfe advised us to use bottles which could be kept inside your jacket and prevented from freezing by body heat, rather than by using ‘platypus’ backpack systems, which can freeze. Rolfe also asked us to make a decision on our route, explaining that although we had planned to start off right on the border with Kenya, on the Rongai route, part of this was a dangerous option right now because of large numbers of elephant in the vicinity. Told that we would need to employ armed guides, and be prepared for them to shoot if necessary, we changed our plans and decided to start by the Loitokiok route, joining the Rongai trail further up the mountain and avoiding disturbing the elephants. Finally, we were advised to always stay behind the lead porter and not to wander off track, and to tell someone if you do, as there are lots of leopards on the mountain. After the briefing we then had to produce our main packs for weighing by the porters, who would carry our main packs, containing our sleeping bags, therma-rests and spare clothing, up the mountain to Kibo camp at 4,750m, and then back down the far side of the mountain to Marangu gate. No porter pack could weigh in at more than 15kg – and any pack that did was opened, there and then, and any items the porters thought were unnecessary or unessential were ruthlessly discarded. The porters would also carry everything else: tents, stoves, food, water and tables and chairs for the mess tent. We would carry our own day sack, weighing about eight kilos and containing our water, food for the day and wet and warm clothing required for conditions on the mountain that day. The rest of the Saturday was spent on a leisurely acclimatisation walk, in our kilts, for about 15 kilometres around the village near the hotel, visiting a waterfall and the local village and primary school. Across the road from the hotel, the footpath passed through some wooden shacks and houses, surrounded by occasional huge trees and extensive banana plantations. This area was once cloud forest and the area had gradually been settled right up to the boundary of the national park. After a few hundred yards, we came across recent graves in amongst the banana plants. These were the graves of victims of tropical diseases – our guide was not specific, but the cause could have been malaria, a serious, debilitating and often fatal disease which is endemic in the lowlands of Tanzania. We were near the upper limit of the disease’s range, at an altitude of 1,600 metres, and yet all our group were taking anti-malarials. Inexpensive by western standards, it is important to remember that such drugs are usually unavailable to locals – and if they are, they’re often forgeries, or are too expensive in an area where the average income is less than two dollars a day. Prevention in Tanzania focuses on not being bitten: the female Anopheles mosquito, the organism that carries malaria, mainly bites at dusk and at night, so using insecticide-impregnated mosquito nets and covering up exposed skin can be very effective. Along with malaria, HIV – or AIDS – and TB are the two other biggest health and development problems facing people in Tanzania and in sub Saharan Africa in general, although cholera and rift valley fever are also significant. Massive burden – About 6.5 per cent – that’s round about one person in every 15 – of the Tanzanian population has HIV, compared to 0.2 per cent (one in five hundred) in the UK, and although that’s not the highest figure in Africa, it is still a massive burden on the economy and health care system. It is worth remembering that a course of drugs to treat a patient with TB costs only 7 for a year’s supply, but the failure of the international system to treat diseases such as TB or SARS in poor countries means that these diseases are spreading into developed countries such as ours. The Tanzanian government is focusing on provision of mosquito nets, condoms, clean water, education and electricity to villages as the biggest drivers of improving health and literacy. On our walk thorough the village we saw several sobering signs saying ‘coffins for sale’. The locals in the area around Kilimanjaro are mainly from the Chaga people, and were very friendly, full of optimism and pleased to see us – as well as being glad we had come to their area, and curious and amazed at all these white ghosts planning to climb Kilimanjaro in kilts. Although Swahili is the national language, many Tanzanians speak English, the international language, which is taught in schools in what was, until 1961, a British mandate. That made it possible to enjoy in-depth conversations about Kilimanjaro, the Chaga people and Tanzanian issues in general. Tanzania is politically stable compared to its neighbour states, Kenya and Uganda to the north and Zambia, Malawi and Mozambique to the south. Its democracy is based around respect for the state, rather than allegiance to a particular tribe as in some other African states. When our group visited the village and school we gave presents of Scottish football jerseys, colouring books, pens and pencils to the obvious delight of the children. Next morning was Sunday, and after an early rise we left behind all our valuables in the hotel safe, our packs were loaded onto the minibus and we set off to begin our attempt to summit Kilimanjaro. We very soon left the tarmac-ed road and sped along a red dirt road that was quite smooth initially but soon got rougher and rougher; we all had a full body massage as our driver tried to break the land speed record for a minibus on a dirt road. Our bus kicked up clouds of red Laterite dust that billowed out behind us, though vehicles travelling the other way did the same thing, kicking choking clouds into our faces as they weaved alarmingly from one side of the road to another, avoiding the rocks which were wrenched from the roadway by the traffic – not surprisingly, near misses were frequent. The dust painted us and our bus red; it penetrated every pore, and covered the locals walking beside the road, on their way to church in their best clothes – yet they still waved, and smiled, and wished us good day. The Chaga people in the area around Kili are mainly Christian, with the south and coastal areas mainly Muslim, a distribution which reflects the legacy of successive migrations, from colonial and modern missionary activity and the history of Arab trading, conquest and slavery in east Africa. The plan was that after covering just 25 kilometres in two hours, our minibus would meet up with four Land Rovers, coming down from the mountain, that would take us the remaining hour’s drive to the park entrance, another 20km away. But Samson was advised by mobile phone that the road was passable, with care, by a two-wheel-drive vehicle, so our bus driver continued to hurtle along. Worryingly close – I was delighted to see a water tanker come the other way, spraying the roadway to keep the dust down; my delight was short lived, as the water turned the road into a skid pan and our bus slewed worryingly close to several steep drops. A short time later we emerged from a pot hole large enough to swallow several lorries, only for the prop-shaft to finally shear, leaving us marooned and blocking a particularly narrow and crucial section of the main road. Samson jumped out, grabbed two large rocks from the road and kicked them under the rear wheels, and lorries, heavily laden with cargo on their way over to Kenya, blared their air-horns at our bus. Their drivers gesticulated and laughed as they chugged, with millimetres to spare, past our sad little broken bus, up the steep rise, their passing scattering us all into the banana plantations to escape the mini dust-storms they created. Soon we were surrounded by lots of children – and some adults – who appeared from amongst the banana palms, very curious about what was going on and good-naturedly asking questions about where we were from why we heading for Kili wearing Kilts. We gave sweets and the remaining pens and pencils to the children, who were delighted at their windfall. After a long wait, the Land Rovers arrived, Samson’s lads transferred the bags, we squeezed in and the Land Rovers raced each other to the gate. We arrived at the gate amongst the plantation of pine trees, and were handed a packed lunch. A large wooden sign warns would be summiteers of the dangers of the mountain: not to attempt to climb if you were not in good shape, no heart conditions, no colds or flus or without a permit and a registered guide and porters. As were already late in arriving due the bus breakdown, our porters grabbed the packs from the roof of the final Land Rover and quickly set off up the mountain, leaving us to finish our lunch. Rolfe called us to get ready, and our lead porter set off up the gentle incline. As we’d been warned, his pace seemed sooo slow! Soon the track surface broke up, and we slogged our way through black volcanic dust stirred up by our feet. It coated us on top of the red dust from earlier, so we slowly turned brown, then black. We soon passed into cloud forest and could hear the go away birds calling in the forest, “gway, gway, gway”. Branches shook, and we glimpsed monkeys swinging through the green. We came across a small stream and directly above us in a large tropical hardwood was a large family group of Colobus monkey sitting on branches way above, watching us disinterestedly as we snapped away with our cameras. We plodded on up the mountain orchids, St John’s Wort lining the trail, and at about three thousand metres the forest disappeared and changed abruptly to low shrubs and heathers. Soon we reached our first camp, which the porters had already set up, complete with chemical toilet – or, as it was more technically known, a bucket. We were allocated a tent for the night, and soon the Masai cook was calling us for dinner. Before we could eat dinner, or breakfast, we had an elaborate hand washing regime: first in soap, then in disinfectant, then a further rinse in different soap, to ensure good hygiene at meal times so that any bacterial infections did not spread rapidly amongst the group – upset stomachs on KJ are a common cause of dehydration and of people’s failure to achieve the summit. Drinking water disinfection is also crucial, and Rolfe ensured that all our water was treated and not one of our group or the porters was ill on the entire trip. Shining snow – We set off at 7am the next morning, and the tropical sun soon drove the temperature up to 35 degrees as we walked, Pole Pole, up the mountain – and as the sky cleared we got our first glimpse of Kilimanjaro. Up high, above the haze, we could see shining snow, and by mid-morning we could see the whole massive bulk of the volcano – and to our left across the saddle that runs between the peaks the jagged outline of Mawenze. All day we walked and neither seemed to be getting any closer. We camped again overnight and set off early in the morning, soon we were all covering up against the sun, doubly scorching because of the altitude. We slogged on, Pole Pole, the porters often singing as they passed us with their heavy loads. By now we could all really feel the altitude, breathing more rapidly and hearts beating faster, and some of the group developed severe headaches. The vegetation was interspersed with black and red volcanic outcrops, while heathers and scrub gave way to gigantic lobelia plants that do grow here on Bute – though up here, they were three to four metres high – and also to dense thickets of senecios, fleshy palms up to five metres high. Occasionally on the trail we could smell the scent of animal-marked territories which the porters told us were Leopard. By the afternoon the heat was intense, so we stopped for lunch. The view was spectacular, looking far into the giant national park of Tsavo in Kenya and over to the Chyulu hills – and later, as we walked, we watched fascinated as the cloud, driven by convective heating of the plains far below, rolled its way up the side of the mountain towards us. By one o’clock we donned fleeces, by half past one warm jackets, and by quarter to two it was sunhats off and warm hats, gloves and scarves on as the hail and snow whirled around us and the temperature plummeted to -10 degrees. We were relieved to reach the camp, and the shelter of our tents at Mawenze tarn, just as the blizzard intensified. Later, after some hot soup, most of our group climbed higher for acclimatisation – to 4,600m on the north-west ridge of Mawenze, on rugged and crumbling volcanic rock, before descending back to camp. The camp in the cirque by the tarn, beneath Mawenze’s north face, is incredibly beautiful. That night was extremely cold and clear, with ice covering both the ground and our tents. The Equatorial stars blazed fiercely through the thin air, the Milky Way was crystal clear and intense and thick. It was a humbling and privileged experience to look across this remote and amazing landscape, glimpsing the lights in the far below and away in Kenya. It made me think about the nature of geological time, and the Kilimanjaro massif being part of the Great African Rift Valley, which stretches in a great arc from the Red Sea coast, through the lakes to southern Mozambique – a great, fractured chasm on the face of the planet, where plate tectonic activity is driving the north east and east of Africa away into the Indian Ocean. In millions of years, the land on the east side of the Great Rift will be an island off of the continent. Kilimanjaro sits on the rift and is a dormant volcano waiting for magma to fill its chambers before it erupts again. North of the mountain, further along the rift, are active volcanoes. The sense of deep time pervades this part of northern Tanzania, which is sometimes referred to as ‘the cradle of mankind’ – this is the area where our human ancestors evolved, around the Olduvai Gorge, and where the first traces of our origins were found in fossil bones. Nearby are the humanoid ‘mother and child’ Laetoli footprints that are estimated to be around 3.6 million years old. Desolate landscape – In the brilliant morning air, we struck camp early and headed across the saddle towards Kilimanjaro. The saddle is a desolate landscape of bare rock, crossed by volcanic dykes and pipes and littered with giant boulders, spat from the volcano. Volcanic pipes can be a rich source of precious gems, and on the slopes of KJ is found a precious stone found nowhere else, called tanzanite. It is a very hard blue stone, and worth, per carat, the same as diamonds. The world’s only tanzanite mine is running out, and the price is predicted to rise. Our guide told us that the local miners were so superstitious that the mine would close that they recently consulted witch doctors who demanded a human sacrifice – which was obtained by tricking some young people into part of the mine, and collapsing the roof on top of them. After walking almost all day, we crossed the saddle we arrived at Kibo hut and camp at 4,700m, at the base of the cone of Kilimanjaro. Most of us were nearly done in, and really feeling the altitude. Three people had symptoms of AMS, and felt they could not ascend any further. After dinner there was a comprehensive briefing from Rolfe, who finally emphasised that if you get the tap on your shoulder you have to go down, with no questions – your sponsors would prefer you “going back in the cabin, not flying back in the hold as cargo”. Later, with some anxiety, we made our summit preparations, carefully checking and rechecking our gear, clothing, water supplies and packing our other gear, ready for the porters to head down the mountain to prepare the next camp when we returned. We then turned in to sleep for four hours. After what seemed like the blink of an eye at 11pm we were woken by a summit porter with a hot mug of sweet tea. The night before, at the tarn, I was very lucky to see leopard hunting above the back of the camp when out for a relief at two o’clock in the morning – the benefit of not taking a pee bottle! I walked somewhat nervously back my tent. Leopard attacks on people on KJ are not unknown – a Japanese climber disappeared in 1998, and was initially assumed to have simply wandered off the track and fallen, until porters later found his pack, sure he had been taken by a leopard. According to our guide, the leopard I saw would be hunting small game, hyrax or mice, which they eat like Mars bars. There are many leopard on the mountain, and buffalo frequently wander, high on the slopes, looking for carbonate salts to lick. From Gillman’s Point, the ridge runs along the edge of the crater to Uhuru and the summit, at 5,895m. On both sides, during the traverse, you can see the ice-fields and glaciers. One of the first Europeans to see KJ – a German missionary – thought the ice fields on KJ were clouds, and then realised it was ice. He tried to tell Europeans back home that there was snow at the Equator; no-one believed him. A real test – The last one and half hours trek from Gillmans to Uhuru is the toughest I have ever had so far in the mountains. The air temperature was minus 15 degrees, and with wind chill from a strong northerly wind blowing across the crater, several of us were frost-nipped in our fingers, toes and lips. Later, when the sun angles up in the sky, things warm up enough to remove your mitts for a short time. 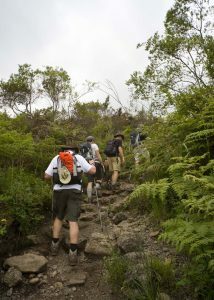 The path undulates over and back around the crater rim, and then climbs the last one hundred metres just before the summit. This takes enormous resolve to climb – the effect of the thin air on your lungs and gravity really feels like it is trying to draw you back down the mountain. Reaching the summit is a great feeling and a real test of mental and physical stamina. Personally, on the whole ascent of KJ, I didn’t use walking poles or take prophylactic AMS drugs as I wanted to understand how I would cope at altitude under stress. Fortunately, I did not suffer headaches, or the insomnia that can occur above three thousand metres. On summit day, past 5,500 metres, even simple tasks, such as using my camera, required a lot of concentration and effort. After the summit, on the walk back to Gillman’s Point, I was dehydrated as a result of all my remaining water being frozen. I felt dizzy, and slightly sick, though after a drink of water I recovered. Coming down from the mountain is thrilling. The descent is very rapid and steep, with a fabulous section of scree which can be run down depending on your fitness. It takes between three and four hours to descend back to Kibo, something that took eight to nine hours to ascend. From our group, all 20 of us made it to Kibo camp at 4,700m. 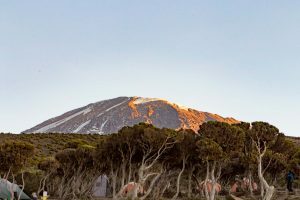 Three people did not attempt the summit due to AMS, and of the 17 people that set for the summit, one person made it up to 5,500m before having to turn back down to Kibo hut. In all, 16 of us made it to the summit of KJ – a high percentage for such a diverse group, reflecting the determination of the party and the skill of our mountain guide Rolfe and our porters and their advice to travel ‘Pole Pole’ – slowly slowly. Most of our group suffered AMS symptoms on the ridge and during the descent from the summit back to Kibo, though by the time we reached Horombo camp at 4,300m after a further five or six hour descent, most of us had recovered. After breakfast on our last day, the porters struck our last camp and assembled in a semi-circle for the tipping ceremony. The porters’ day rates for what is a very tough job are low by our standards, but not by local standards, and the tip given by us is a significant enhancement to their wages. The porters all belong to a union, and Rolfe and Samuel, the head porter, distributed the tips openly and transparently according to the responsibility of the each, with summit porters and the cook getting a larger proportional share. We all tipped more than a hundred dollars each into the pot, and the porters sang us a traditional Chaga song about Kilimanjaro at the end. We said goodbye to some of the porters who were leaving our group and going straight back up the mountain – porters such as Hans, who has summited KJ more than 80 times and is only 24 years old. 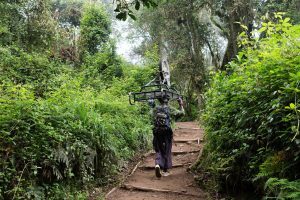 The trek that day down from Horombo camp was very pleasant – you could feel the air thickening and warming, and energy returning to what had been very weary legs. We were now on the far side of the mountain from where we started, and had panoramic views down towards the coastal plantations and Moshi. We passed through the belt of Senecios and entered the cloud forest again, near the Mandara huts, and on the trail we were privileged to meet blue monkeys this time. Too soon, we reached the Marangu park gate. We completed the permit formalities, and we were issued with a certificate if we had made it to the summit, or to Gillman’s Point, or to Kibo. The souvenir shop sells ice cold bottles of Kilimanjaro beer, and the fridge was quickly and efficiently emptied by the Kilts to KJ team. We said our final farewells to some of the porters and our Masai cook, who accompanied us to the gate, and boarded our bus back to the hotel for our first wash in more than a week. In all Kilts to Kilimanjaro raised around 45,000 for Aberlour with the final total yet to be tallied. I would like to thank all the people and businesses on Bute and beyond who sponsored me on this charity trek for Aberlour, and I hope, by writing this, to encourage others to support Aberlour and other worthwhile causes. 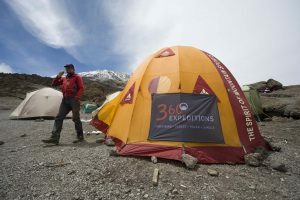 If this article has inspired anyone, Aberlour are running a trek to Annapurna base in the Himalaya – if you would like to take part please go to www.aberlour.org.uk. Finally I would particularly like to thank Bill Cook, who initially inspired me to undertake this fabulous journey and my family and friends, who were supportive throughout.